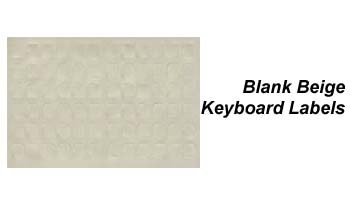 Beige keyboard labels can be placed on keyboard keys to create blank keys or a blank keyboard. Beige Keyboard Labels - Suitable for blocking out keys on keyboards. The label set includes 72 beige, opaque labels that fit standard keyboard and laptop alphanumeric keys. DataCal keyboard labels are designed to fit desktop and laptop computer keyboards.Laptops with smaller than standard keys may not be compatible with the DataCal label sets.